Apple packed a number of upgrades into the new iPhone 5S. There’s a fingerprint scanner, a faster processor, a motion-tracking chip and an improved camera. 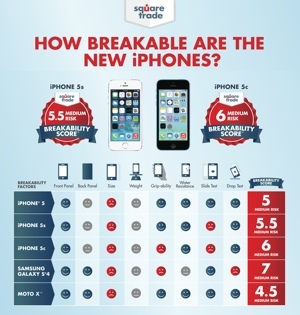 But according to phone insurer SquareTrade, there’s one area where the latest iPhone falls short of its predecessor: breakability. In what is becoming a new phone tradition, SquareTrade put the new iPhone 5C and iPhone 5S through a series of brutal tests where the phones are slid, dropped, splashed with water and more. On a scale of 1 to 10, where 10 is the highest risk for damage, the new iPhone 5S scored a 5.5 and the new iPhone 5C scored a 6. 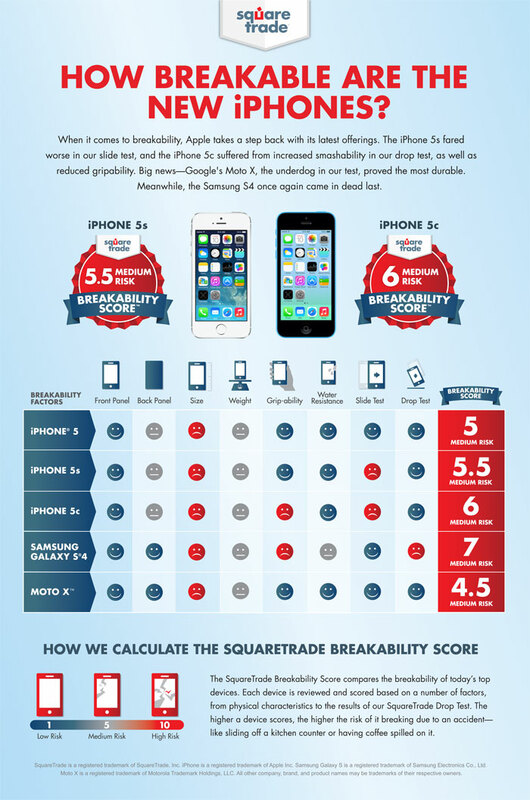 In comparison, last year’s iPhone 5 rated a 5 on SquareTrade’s scale. Though Apple may have made its flagship phone more fragile, it’s still holding up better than Techlicious’s favorite Samsung Galaxy S4, which earned an ugly score of 7 in the tests. Google’s made-in-America Moto X scored a 4.5, meanwhile, making it the sturdiest phone of the bunch.